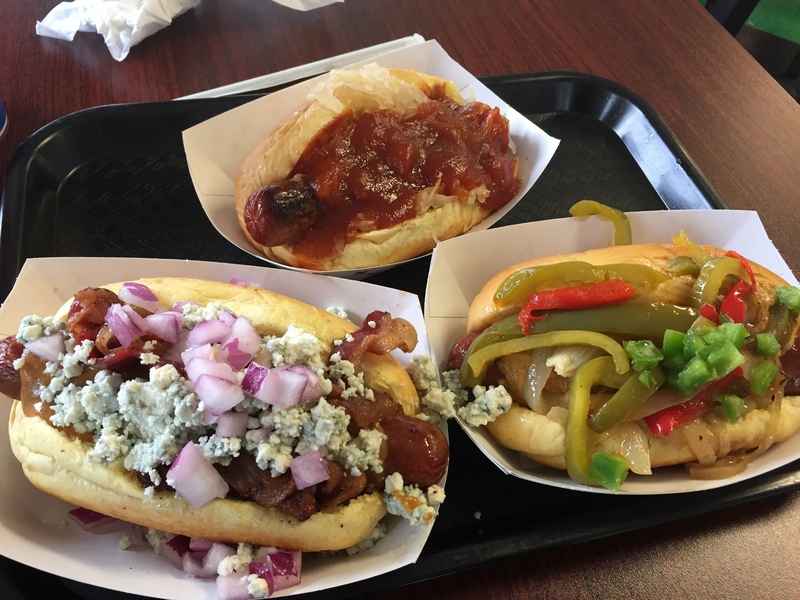 I try to give a “shout out” to local businesses when I can – and the other day while visiting my Mission location Lennie and I stopped at the “New York Dawg Pound” in Shawnee Mission, Kansas. So I ordered the “Boxer”, which is a quarter pound hot dog with blue cheese crumbles, bacon, red onions and sweet mustard. IT WAS DELICIOUS. Not all that healthy, but delicious. Starting at the top and going clockwise: The “Spike”, the “Dalmatian”, the “Boxer”. If you like a hot dog and are in the Kansas City area, you should certainly give these guys a try. They have a “patter” that guides you through the ordering process, and the sky is the limit with these guys. There you go, a yummy lunch at reasonable prices with a fun menu. I like small “mom and pop” restaurants like this, sometimes you get a home run! Mission Repair is closed on Saturday, July 4th! We’ve already had a few calls about this; so I want to remind each of you that we will be CLOSED JULY 4th, 2015! Normal business hours will remain in effect Friday July 3rd and after the 4th. Since we are open on the 3rd, I want to make everyone aware that FedEx is on a modified shipping schedule and we’ve been “warned” about their changes. They are picking up early on Friday, so we will do everything that we can to get repairs done and completed and shipped back out to our customers. Independence Day means fireworks and BBQ’s for the Arter Family…I hope you spend some quality time with your own family as well. Good morning friends of Mission Repair! I got into the office this morning, and received this review from our Mission, Kansas location and had to repost. I love starting my mornings off like this! Just wanted to say thank you for the great experience I had with your Johnson Drive repair facility today. I HAD an I Pad 3 with a cracked screen and a corner of glass missing so I searched Google for a local repair facility that did not charge an arm and a leg to repair my I Pad. I came across your website as well as many others that provide local drop off service and selected yours based in part on price and reviews. Well I arrived at your shop this morning and was promptly greeted by one of your techs. He was very professional and took care of me right away. He advised that it may not be finished until tomorrow which I was good with, but that if it were done earlier he would call. Now I would like to also state that I noticed that your store was very clean and neat along with the professional attitudes and appearance of your tech. I got an exact upfront price on my repair and so I paid the bill and left my I Pad. To my surprise I got a call about 3 hours later advising me that my repair was complete!! I returned to meet another one of your techs which was just as professional and he delivered my I Pad back to me promptly. I must say that the I Pad looks as good as new and it was delivered to me in protective bubble wrap for a safe trip home. I own five Apple products and three Android products, and although I hope to never need your services again, if I do I will feel confident that you can honestly take care of any repair needs. I Highly recommend you service and would feel confident in referring anyone to your company. Thanks again Tommy for the great post on Facebook, have a great week! Shopping for a new home – easier said than done! We are at a cross-roads here at Mission Repair in our Olathe location, and our long-term lease is coming due. So this big question is, do we renew or relocate our headquarters? I’ve poised the question to our employees at our quarterly meeting, and we have a split decision. I mean we just finished out new shipping room and new break room and it seems that we are all doing quite well with the space we have…in fact there’s still more room to grow. However our current space is down a dead end street and not all that convenient for our customers to find us. How would a drive through work? It’s possible that Mission Repair will have the first drive-through iPhone repair center in the country (that I know of) – so we are working on it. It would be especially helpful in the cold winter months here in Kansas so our customers wouldn’t have to jump out of the car with the kiddos in the snow…things become a mess. Well, we’ve got another meeting today at 11:00am to visit a few locations right off of I35, so I’ll have an answer for us soon. It’s a tough decision to move from a home that we love; and yes I only live about 5 miles from our current location. Maybe it’s time to relocate a bit for our customer’s sake, we’ll have some more info for you soon! Take care, have a great day in the sunshine, wherever you are. Mission Repair quarterly meeting a success! Kind of. It’s true; I try to keep our employees up to date, connected and on the same page. It’s called MANAGING. Some of you may have heard of it, but I know that others have not. Every quarter I get the team together and we head to Bass Pro Shops here in Olathe, Kansas and reserve a meeting space. It’s a good time to get away from the hustle of the work environment, and everyone gets a few extra hours on their paycheck AND a good meal! 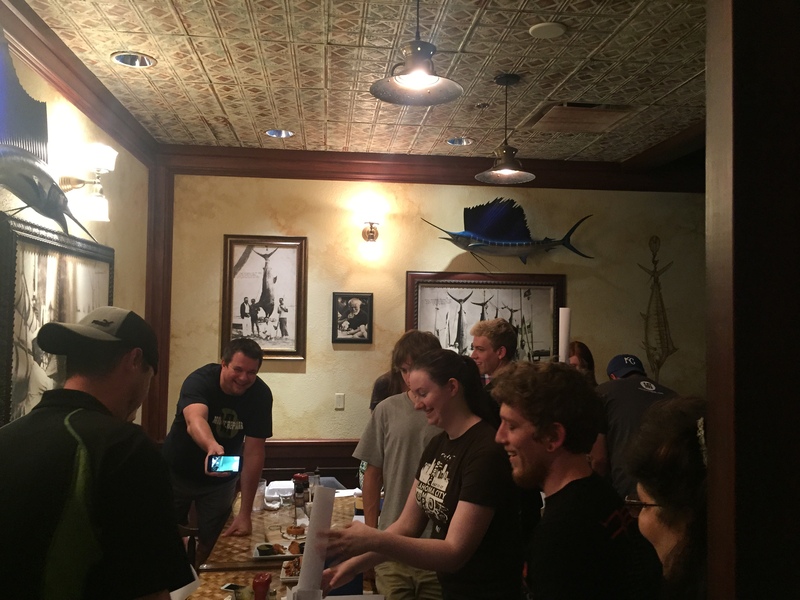 This time I broke the group into teams, gave them 9 pieces of paper, and told them to work together to make a tower that stood on it’s own, with only the 9 pieces of copy paper and some scotch tape. The key was that the tower had to be at least 40 inches tall. Ready, set, go! I’m there in the background because my Colorado crew was joining in with us on Facetime, so I was showing them what others were doing via my iPhone…but it was fruitless. 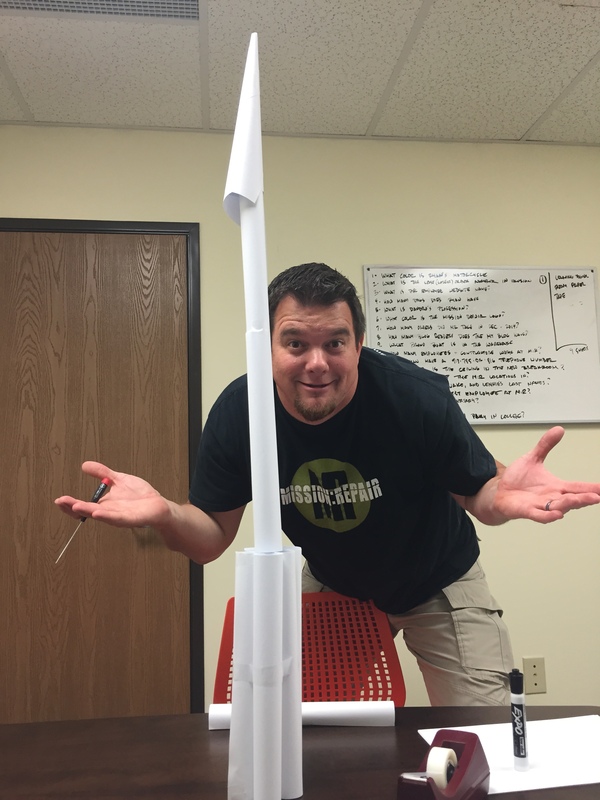 Those guys in Lakewood, CO killed it and came up with the best tower of all. In the foreground of this picture was Jake (backward hat) who failed miserably as a team leader 😉 I’ll just keep him to fixing devices, not building paper towers. These times are all about fun and business, and we got a lot done that night. The new training schedule was announced for our employees, so soon when you call in you may hear some “refinement” from our newer employees…that’s a great thing! I’m always looking for new group team building activities, have any ideas? I look up to our forefathers. A couple of weeks ago, I had the privilege of visiting Mt. Rushmore. It wasn’t the first time I was there, but this time I spent a lot of time enjoying the scenery, the history and the reason behind the monument. I also took the hike to the bottom of the mountain and snapped this picture looking up at the granite 4-some. It’s awe inspiring and hard to believe that artist Gutzon Borglum dedicated his life to the project and started it on his own. Yes, he had some help and the project was finished in 1941 and is now open year round for visitation. George Washington, Thomas Jefferson, Theodore Roosevelt and Abraham Lincoln all sit stoically for the ages. Did you know that this was almost a sculpture of Lewis and Clark? I didn’t until my last visit. I highly recommend it! While there, I made friends with a German fellow that was also impressed by the monument. I said something to the effect of “This is a fantastic piece of American history, isn’t it” He replied by inviting me to visit Germany to see some “real” history. OK, Ok, I’m sure there are some amazing things to see abroad, but this sculpture is something that everyone should see. I mean it. Have a great day…I know that a lot of Americans are on vacation right now; I hope your travels take you to amazing places.